Jenks Public Schools Math and Science Center has received LEED® Gold certification administered by the U. S. Green Building Council (USGBC). This is the first dedicated K-12 education project in the State of Oklahoma to receive LEED® Gold certification and the first building in the City of Jenks to receive LEED certification at any level. LEED, or Leadership in Energy and Environmental Design, is an internationally-recognized green building certification system. The project was built by Tulsa-based Manhattan Construction Co. and designed by Tulsa-based GH2 Architects, LLC and Michigan-based TMP Architecture, Inc.
Four vertical axis wind turbines in which output can be monitored wirelessly and integrated into curriculum to study renewable energy. Ground source heat pumps which use the mass of the earth to temper water to heat and cool the building. The system pumps water through 217 vertical wells, which are each 400 feet deep, using approximately 33 miles of piping. High efficiency appliances to reduce water waste. High efficiency plumbing fixtures to reduce water usage. White reflective roofing material, concrete paving, and vegetated canopies will significantly reduce the heat island effect of the project. The high-performance building envelope includes insulated metal panels and high-performance window glazing. The windows are protected by fixed vertical and horizontal sunshades to reduce glare and solar heat gain that is produced by direct sunlight. Large strips of high-efficiency windows provide the classrooms with an abundance of natural light, which has been proven to increase learning retention. 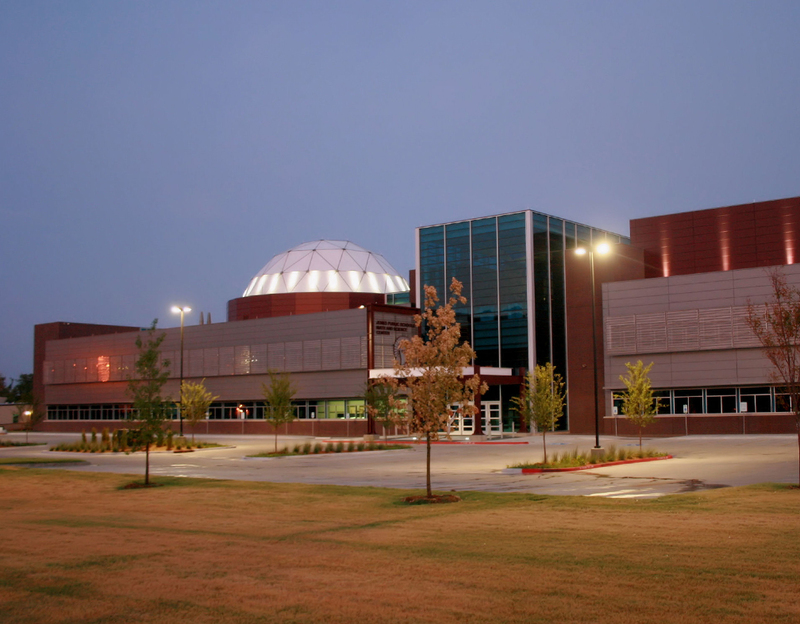 The Jenks Public Schools Math and Science Center project has also received the 2011 Honor Award from the Eastern Oklahoma Chapter of the American Institute of Architects (AIA) and a Jury’s Choice Award from School Planning and Management. Jenks Public Schools is recognized as a leader in public education throughout the state of Oklahoma, as well as the nation. The District has been awarded the Malcolm Baldrige National Quality Award for their leadership in the field of education. Jenks Public Schools serves over 10,000 students. You are currently browsing the Manhattan Construction Group blog archives for January, 2012.